‘I located a beautiful sanctuary who was very happy to rehome Thunder. This sanctuary already has a female kookaburra named Adelaide, so Thunder would have gained a girlfriend companion. In the sanctuary, Adelaide is free to hunt her own food and live in a beautiful habitat. The not-for-profit Sanctuary was ready to drive up and collect Thunder. I visited the pet store and explained my suggestion with the Owner, and how it would be a compassionate decision to relocate Thunder to the Sanctuary. Unfortunately a vocal minority of Australians took it upon themselves to track down the Pet Store and constantly make verbally abusive phone calls. The Owner was so fed up with the barrage of hateful phone calls, that he just wanted the problem to go away. This completely jeopardised my rescue and rehoming solution for Thunder. He is returning Thunder to Florida, and we have no way to trace him. I imagine that Thunder will remain in a cage, in a pet store in Florida. People in Virginia are still actively trying to help Thunder, in a professional manner, Thunder’s case is still active and in negotiations. This situation needs to be dealt with carefully and diplomatically and by those experienced with wildlife/birds. People contacting and abusing the store are not helping and may be putting the bird’s safety at risk. The Federal Environment Department in Australia have stated that he wouldn’t be allowed entry into Australia. We can now confirm that, according to sources in Virginia, that Thunder was legally obtained by the pet store who have a permit to hold and sell him. They purchased Thunder, as a chick, from a licenced breeder in the USA who has legally bred kookaburras for decades. The AWPC will update the outcome as soon as we hear news. Please read our full article below for important background information. FYI (as per the article below) the AWPC did not say to just ‘leave the bird were it was’, we were actively working on getting details and still in communications with Wendy to establish the best welfare outcomes for him. Wendy Davidson in Virginia USA contacted the AWPC on March 19th. She was very concerned about the welfare of a poor kookaburra (Thunder) that is being sold at a local pet store. It is housed in a small cage and sometimes dressed up in outfits. We also have concerns for the bird’s welfare, no bird should be kept in a small cage like this, but we are also are mindful of the laws and other matters to consider. Luckily the bird is being fed an appropriate diet, at the very least. Firstly, it is essential to establish the legality of the store’s possession of Thunder. This isn’t the first kookaburra the store has sold. Apparently, kookaburras are becoming a more popular pet in the USA. Thunder may have been illegally obtained, only the authorities in Virginia will have that information, and we have advised Wendy to contact DGIF, the state department who regulate wildlife and exotic pets in her state, and once we have this information we can work towards the best outcome for the bird. However, he may have been legally bred and that if this is the case unfortunately there is nothing legally that can be done from our end. Another approach would be then taken. As yet, the AWPC hasn’t been given enough detail to help in any practical way i.e. we don’t have the name of the pet store to ask the DGIF in Virginia the legal status of the bird. Hence our advice to Wendy to investigate this in Virginia. We have advised her to not buy the bird, as this just perpetuates the market for wildlife. If people are making money out of breeding Aussie species they will just breed more and sell to inexperienced pet owners, which isn’t good for all the other wildlife out there. It also encourages people to take animals from the wild to breed and sell and we don’t want that! 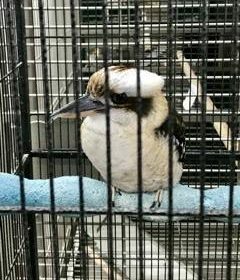 If Thunder the kookaburra is legal, the best option is to encourage the pet store to hand the bird over to a sanctuary, in good faith. A best practice wildlife sanctuary in the USA, preferably with other kookaburras, would be the best option and we are happy to help Wendy investigate a suitable home if needed. Putting this poor bird on a plane back to Australia would be cruel and unethical. Thunder has only ever know a small cage in the pet store, and birds can be injured or even die if put in stressful situations. Even re-homing a bird that has lived in a small cage for years needs careful consideration, it will need some rehabilitation over a period of time to be introduced into a bigger enclosure, it will stress otherwise. The welfare of the bird should be paramount. Importantly, Thunder would not be permitted back into Australia by the government due to quarantine laws. Australia has some of the strictest quarantine regulations in the world. It is worth noting that it isn’t illegal to breed and sell exotic pets including wallabies, sugar gliders, cockatoos, galahs and many more; as long as they are bought from a licenced breeder. You need to apply for a permit from state wildlife authorities and pay a fee. The same rules apply here in Australia and many native animals (including kookaburras) can be kept on a private licence. Ch 7 news stated it is illegal to have a kookaburra as a pet in Australia, which isn’t technically true. The AWPC does not support native Australian animals being taken out of the wild and kept as pets. The pet store has told reporters that the bird was legally obtained from a breeder who has been breeding them for decades. If this is true, then the birds may well have been legally imported into America decades ago when the laws were different and have been bred ever since. 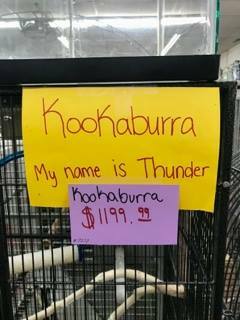 The pet store says they hand-raised Thunder from a chick. “We would like to address this concern by stating that thunder was not taken from the wild in Australia shipped over to our store! Exportation of birds was outlawed over 20 years ago,” the post read. “All of our baby birds including thunder have come from our reputable baby breeders that we have been doing business with for 30 years. Have a look on the AWPC Facebook page for more information about wildlife as pets etc. ; we have made several comments on our posts that might be of interest. We are waiting on an update from Wendy. FYI regarding the comment about the AWPC. I have been speaking to Wendy about the kookaburra and waiting for details of where this pet shop was etc so we could investigate the legalities first. We certainly didn’t ‘pass the buck’ and were concerned about the birds welfare and willing to act and help where we could. The ABC didn’t contact us for comment. Well done Wendy Davidson for bringing this case to the attention of the media worldwide and to the Australian and American authorities. The issue of the wildlife trade, both legal and illegal, is a very important issue, and you have raised much needed awareness for Australian wildlife!